As you know the parental unit went off to the US of A last year for a whopping three months. They did plenty of cool things while they were there. The Wam was even in the Big Apple for the US Open and scored some pretty amazeballs seats to watch Feddy Baby (aka Roger) play tennis. They also got to go to the biggest Christmas shop in the world (well I think it was the world). This is a place called Bronners and it is HUGE. Anything Christmas you can think of they will have. Think nativity scenes from all over the world, decorations and tinsel and all things Santa. The rents even had to phone each other at one point because the shop was so huge and they couldn’t find where the other one was. I was lucky enough to receive an awesome pressie from this shop and it’s now hanging from my cupboard door – I think it’s too cute to save only for Christmas time. 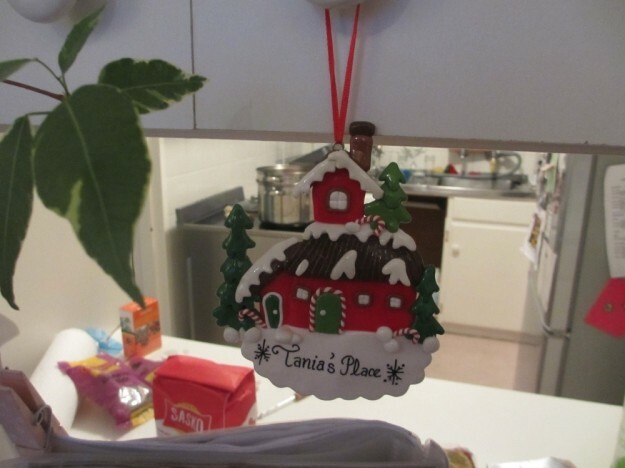 This entry was posted in Luv and tagged christmas, presents, the wad, the wam. We were bleak that we couldn’t get more stuff! I am not a great fan of Christmas decorations, but this place just made me want to own stuff! Like Christmas stockings and bells and baubles galore! I love the sign that said Pray for snow – I’m a teacher!